Although most pet parents appreciate that good grooming helps keep their pups attractive and pleasant to be around, they may not realize that grooming also has an effect on health. 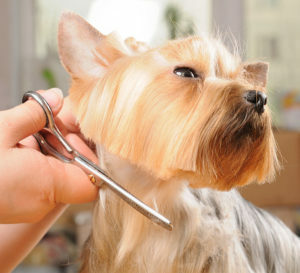 If you want to keep your dog healthy, a regular grooming regimen is essential. In particular, grooming helps with coat and skin health, as well as giving you an opportunity to spot other underlying health problems. Regular brushing distributes your dog’s natural oils throughout the coat to ensure healthy fur. For breeds with a double coat (a downy undercoat beneath longer hair, like Collies or Chows), make sure that you brush against the grain from time to time, especially in spring and fall, to removed shedded undercoat which can easily get matted. Other dogs with silky or wiry coats have their own needs for special brushing techniques or even trimming, so make sure your research the proper grooming technique for your pup if you’re doing it yourself. Brushing also helps with skin health. If your pup’s coat becomes matted or tangled, it can create a constant, unpleasant pull on the skin, creating discomfort or even more serious skin irritation. Keeping the coat free of such issues helps make sure your pup’s skin is healthy and comfortable. If your pet has dry skin, a product like OxyMed Oatmeal Shampoo by TropiClean can help address the issue and keep your pet healthy. Most importantly, regular grooming ensures that you carefully inspect your pet for health concerns that can easily go overlooked. As you brush your dog, you have the chance to carefully examine the skin, coat, and sensitive areas like the ears. You may spot rashes or wounds beneath the coat, find a flea or tick occupation, or even catch more serious ailments like cancer early enough to pursue treatment. If you find any strange lumps on your pet’s body, follow up with your veterinarian, and you may save your dog’s life. Good grooming is more than just keeping your dog looking and smelling good—it’s also a critical way to keep your pet health and comfortable, even while being an incredibly simple habit to take up. Once your dog is used to the grooming routine, it can also be a great time of bonding between the two of you. TropiClean offers an extensive line of grooming products, including hypoallergenic shampoos, flea and tick products, ear cleaner, and aimable shampoos. Pick up your favorite scent to help with your new grooming routine and keeping your pup clean and healthy.